When environmental campaigners began tracking a hi-tech South Korean trawler off the coast of West Africa, they were looking for proof of illegal fishing of dwindling African stocks. What they uncovered was an altogether different kind of travesty: human degradation so extreme it echoed the slavery they thought had been abolished more than a century ago. "It was horrendous," said Duncan Copeland, a senior campaigner at the Environmental Justice Foundation, who boarded the South Korean-flagged trawler at the end of 2008 with naval forces from Sierra Leone. "The men were working in the fish hold with no air or ventilation in temperatures of 40-45 degrees. It was rusty, greasy, hot and sweaty. There were cockroaches everywhere in the galleys and their food was in disgusting boxes. All they had for washing was a pump bringing up salt water. They stank. It was heartbreaking." As their investigation continued, the EJF found vessel after vessel, some up to 40 years old, rusted and in terrible repair, engaged in pirate fishing – an illegal trade that damages already fragile marine stocks and exploits human labour in shocking conditions. The 36 crew members on the boat boarded by Copeland came from China, Vietnam, Indonesia and Sierra Leone. Eight men shared a tiny windowless area of the fish hold with four cardboard "bunks" resting on planks. Four worked in the hold sorting and packing fish for the European market while four slept, and they would alternate, literally rolling out to allow the next to roll in. The Sierra Leonean crew members said they were not paid with money but in boxes of "trash" fish – the bycatch rejected by the European market – which they would be given to sell locally. If anyone complained, the captain would abandon them on the nearest beach, they said. "The conditions aren't good, but we can't do anything about it," a worker on another South Korean-registered ship told investigators. "We live with it, because it is hard to find work. If someone offers you a salary of $200 to support your family it's not good, but we have to live with it." In May, about 150 Senegalese men were found labouring in a ship off Sierra Leone; working up to 18 hours through the day and into the night, eating and sleeping in spaces less than a metre high. The vessel carried a licence number for importing fish to the EU, showing it had passed apparently strict hygiene standards. EJF also found several apparently redundant trawlers out at sea still with crew on board, some of whom had been there more than a year with no radio or safety equipment. "I was sent here by the company," said one fisherman on a trawler off the coast of Guinea. "The company sends a boat with supplies to bring me food like fish and shrimps. Nobody wants to come here." The fishermen's tales reveal the human toll of pirate fishing, a business thought to produce a catch of at least 11m tonnes of fish a year worth more than $10bn (£6.3bn). Vessels often stay at sea for months on end, with reefers coming alongside every couple of weeks to unload the catch and resupply them. As they operate in remote waters, they can avoid detection for long periods. The crew are effectively imprisoned, most cannot swim and many of those interviewed by EJF meet the UN definition of forced labour. Reports of violence, withholding of pay and retention of documents are common, said Copeland. The investigators found a crew of 200 Senegalese operating off Sierra Leone in 2006. 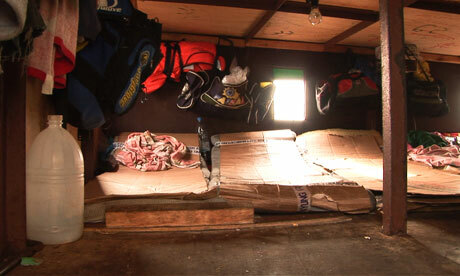 The men were living in a makeshift structure built on the stern of the ship, divided into four levels with barely a metre of headroom and cardboard packing boxes crammed together to serve as mattresses. The ship did not appear on the official list of vessels licenced to fish in Sierra Leone at the time of sighting. Records show that it has visited Las Palmas in the Canary Islands, which is the largest landing point for west African fish into Europe and has been criticised by senior EU officials for its lax inspection regime. But the investigators' original interest in fish stocks also produced worrying evidence. Several of the vessels boarded by EJF are bottom trawlers, licensed to import to the EU, catching high value fish such as shrimp, lobster and tuna. Bottom trawlers drag heavy chains across the sea bed, scraping up everything in their path including coral. In one case, the boat had been dumping more than 70% of its catch overboard, including sharks – once the fins had been removed for the Asian market. The vessel's owner had been putting its Senegalese crew out to sea in small boats to bring in tuna and shark to sell as caught by "hook and line, having first identified fishing targets with global positioning software. Many of the Senegalese were fishermen unable to sustain a livelihood in their own waters because stocks have been decimated by overfishing by hi-tech trawlers. The EJF believes most illegal fishing is carried out by ships flying flags of convenience. Under international maritime law, the country where a ship is registered is responsible for its activities. Some countries allow vessels of other nationalities to register with them for a few hundred dollars and are known to ignore offences. Pirate vessels can re-flag several times a season and frequently change their name. They are often backed by shell companies, which makes their real owners hard to trace and law enforcement extremely difficult. The maximum fine for illegal fishing is around $100,000, which is typically less than two weeks' profit from the trade, according to EJF. The South Korean captain, first mate and engineer of one of the ships were arrested by the Sierra Leone navy and fined $30,000 plus their catch for fishing in the country's inshore exclusion zone. The same ship was however spotted in August, fishing again off the coast of Sierra Leone and Liberia according to EJF. Does illegal fish make it to UK? Deciding whether the fish on your plate is from an illegal catch from west African waters remains difficult, but it should be getting easier after a crackdown in recent months by the British and European authorities. Under an EU regulation brought in this year, it is forbidden to import fish into the member states unless it has been certified as legal by the flag state of the vessel. That means if a ship sails under a Spanish flag, Spain has to certify the catch as legal. Campaigners believe the problem remains that some countries, including South Korea and China, are not effectively policing fishing vessels using their flags. Investigators believe pirate fish are "laundered" – packed in boxes with the stamp of a licensed fishing boat. During checks in 2006 and 2007 the Environmental Justice Foundation found west Africa-caught denton, commonly sold in the UK as snapper or sea bream, in London fish markets. Some boxes of frozen denton carried the logo of a Chinese company that operates many of the illegal fishing vessels the EJF had observed operating in Guinea. The problem of pirate fish reaching the plate is thought to be greater for consumers in southern Europe, which consumes the bulk of west African fish, shrimp, prawn and lobster.